This unabashed arcade-like experience invites you to indulge in the simplest of pleasures – level design that requires a sharp memory and almost-rhythmic movement, accompanied by action that demands lightning quick reflexes. We would use the phrase ‘twitch gameplay’ but today’s youth would no doubt think we’re referring to the popular streaming service. 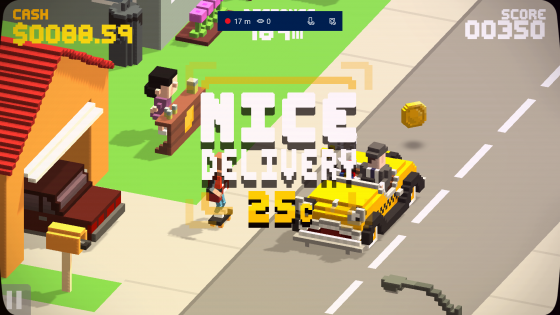 The VideoKid is a game so simple, in fact, that it’s even simpler than its inspiration – Atari’s celebrated Paperboy. You’re no longer able to swerve all over the road like a teenage cyclist drunk on Hooch, as here movement is restricted to swapping between three lanes. 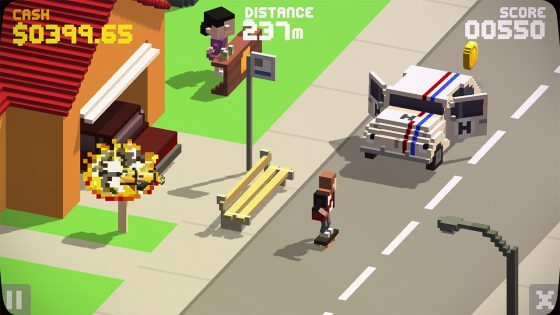 The titular kid, who resembles Marty McFly in his default skin, can however leap over obstacles while performing stunts, due to favouring a skateboard over a bike. The VidKid’s goal? To deliver the latest batch of bootleg VHS tapes to his customers, while racing against the clock to reach a date on time. The draw here is the use of ‘80s icons. To say they haven’t been used sparingly is an understatement – random appearances from ‘80s characters and iconic vehicles are never more than a few seconds apart. Certain vehicles can be leapt over, while every film star and cartoon character found casually wandering down the street must be avoided to prevent a collision. They each have slightly different patterns of movement, which is where good old memory skills come in. Sound also plays a part, as a cameo’s arrival is announced via a purposely distorted soundbite; usually a snippet of a theme tune or a speech sample. While alarmingly cheeky – the developers clearly didn’t seek permission before filling their game with countless renown characters – it does help to add an extra dollop of nostalgia. They’ve presumably “managed to get away with it” – to quote Scooby Doo – as all objects and characters are constructed from blocky super-sized pixels, a la Pac-Man 256 and Crossy Road. Incidentally, if you enjoyed those two you’ll probably find this an utter delight. Visually, The VideoKid is curiously appealing. The colours used are bold and bright, everything moves smoothly, and the characters are well drawn and instantly recognisable. There’s a good mixture of cartoon and movie characters present, including a few that we completely unexpected such as Danger Mouse and The Fraggles. And as you would expect, all the renown ‘80s cartoon characters turn up at some point – Thundercats, Ghostbusters, Scooby Doo, Transformers, He-Man, et al. Variation within the level design comes from tricky fixed-route sewer sections (no prize for guessing the cameo here), which aren’t randomised like the rest of the game. Intersections throw a curveball into the mix too, featuring set-pieces that occur so suddenly that only a second or two is given to get out of harm’s way. There are also power-ups, including the ‘Mega Glove’ that spits out VHS tapes with reckless abandon. It’s a shame you can’t save power-ups for when they’re needed. Another minor quibble is that the chunky text that appears on screen when successfully throwing a tape into a mailbox (“from way downtown!”) often obscures the action. Money gained by delivering tapes can be spent on new character skins, also based on ‘80s icons, and a small assortment of new skateboard tricks. That’s your lot for extras – there are no additional modes or anything of the sort. Now here’s the clincher – The VideoKid is a mere £3.99. It loses much of its novelty and appeal once you finally reach the finishing line and have seen every cameo – a feat. that involves countless botched attempts beforehand – but while the fun lasts it’s almost guaranteed to put a smile on your face. Addictive and well-designed, it’s one of the best budget buys currently around.